The term ‘Coaching Tree’ is one that is familiar to those that follow American sports. There, coaches spend time learning under more experienced colleagues before branching out from their mentor to form careers in their own right. That term, however, can similarly be applied to football, and one of the most fascinating coaching trees is that of the Argentine Marcelo Bielsa. Over the last decade or so there have been numerous examples of coaches emerging from Bielsa’s shadow, whether from a purely theoretical viewpoint as with Jorge Sampaoli or a more practical outlook, as is the case with Eduardo Berizzo of Celta Vigo. You could, however, argue though that it is Tottenham Hotspur coach Mauricio Pochettino whose career has been most influenced by Bielsa. The Spurs coach grew up in Murphy, a small and unremarkable Argentine town. The story runs that as a young man Pochettino was awakened by his father late at night and paraded in front of a coach who had driven to see the young player that was generating hype. That coach was of course Bielsa, and having taken one look at the tall frame of Pochettino he signed the youngster on the spot without watching him play. Pochettino went on to have a solid if unspectacular career as a player, winning 20 caps for Argentina and becoming a fans’ favourite at both Newell’s Old Boys in his native Argentina and Espanyol of Spain. You could assess that Pochettino is set to make even more of an impact as a coach than he did as a player. In 2009 Pochettino was appointed as head coach at Espanyol despite having little prior experience. 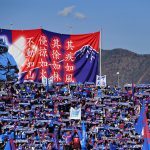 Quickly he developed a reputation for playing direct attacking football and for favouring young players. Despite developing a positive reputation as a coach, though, it was still a surprise to see him appointed as manager of Southampton in 2013. His time on the south coast of England did nothing but enhance his status as one of the most promising young coaches in the game as he started to implement various tactical concepts that are similar – although not identical – to those deployed by Bielsa. Since taking over at Tottenham Hotspur in 2014 we have seen his tactical approach morph slightly to take in to account the nature of the English game. Spurs do not press quite as high up the field as Espanyol and Southampton did under Pochettino, but they do press very effectively in targeted areas of the pitch. Pocchetino employs four key tactical concepts to mould his Spurs side together and form a unique tactical identity. One of the key choices that a coach has to make when setting up tactical concepts for his side is how they are going to build their attack when in possession. Some favour a more possession-oriented approach while others prefer to be direct, moving the ball quickly through the thirds. Under Pochettino, Spurs have been favouring a direct approach but one that is being built from a low platform. 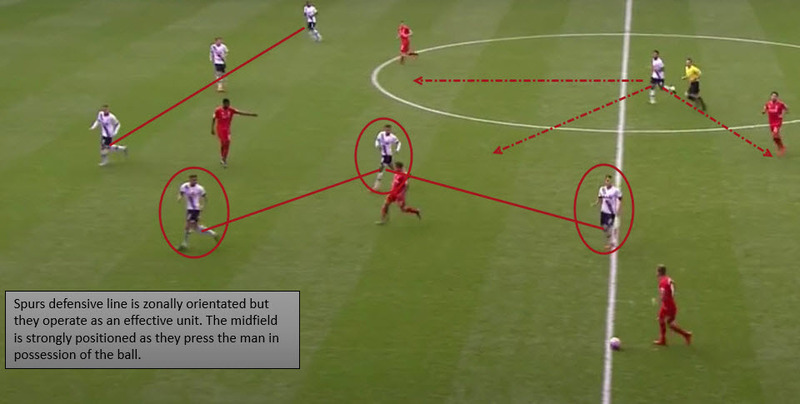 What this means is that when in possession and building the attack the centre-backs become involved in moving the ball forward as opposed to the central midfielders. Here we have Spurs in possession of the ball. There is a large gap between the Spurs midfielders as they split to support the attacking line and to support the build up of play without looking to pass short through the midfield zone. Instead, the centre back will look to play intelligent direct passes to the feet of the players that are in the attacking block. This style of play also leads to the opposition’s defensive structure becoming deep and relatively ineffective. Once again we can see Spurs building from deep. This time I have highlighted the lone sitting midfielder whose role is to remain disciplined, allowing others to join the attack while he covers for the defender who may choose to drive out of defence with the ball. The wide attacking players in this system are encouraged to move infield to occupy the half spaces. 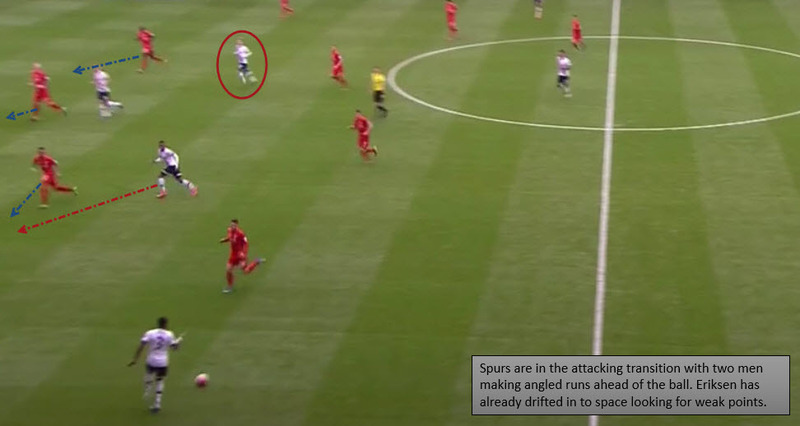 This allows the Spurs full-backs to move forward unopposed into the wide areas. When the situation allows, the Spurs centre backs favour the long diagonal pass to the full-backs in these wide spaces. In terms of the midfield, Pochettino is capable of switching his preference between the three-man midfield of the 4-3-3 and the slightly different three-man midfield of the 4-2-3-1. Each system, of course, has slightly different roles but in both there is usually one holding midfielder who is expected to support the defence, and one roaming midfielder who is free to support the attack and move into zones of space where possible. A simple image this time but one that shows the role of the holding midfielder when the play is being built from the goalkeeper. Pochettino uses the same structure in this position as Bielsa, and which Pep Guardiola adopted very quickly as he began to make a name for himself as a coach. The defensive midfielder drops back between the two centre-backs as they split into the full back areas. This small movement is meant to give the team in possession a numerical advantage in the first third of the pitch allowing for the play to be built up methodically. Indeed, this is now standard practice for a number of clubs. This shows the role of the defensive midfielder when the attack is in a more established position. The holding midfielder will hold a deep position relative to the rest of the team so that he is available should the ball be pressed by the opposition. In this instance the ball can be easily circulated back to retain possession. 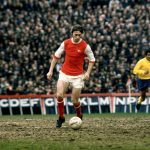 There are two options for Spurs – to play to the underloaded side of the field as the man in possession can attempt the low percentage pass himself, or turn the ball back to the deep midfielder who has a much safer passing angle to switch the play. The initial pressing trigger for Spurs under Pochettino this season appears to be when the opposition cross the halfway line. At this point Spurs’ midfield will trigger a press that is occasionally supported by one of the attacking players or by the near-sided full-back. This isn’t the high and aggressive press that we first saw from Pochettino in English football with Southampton, but it does appear to be very effective. Bournemouth have the ball just inside the Spurs half and are about to play a short pass to the right line. Three Spurs players are already actively involved in the press and the short pass out wide will trigger the full-back to join in and support the pressing movement. As we have seen before, the roles of the Spurs midfielders are slightly split and the deep midfielder sits and occupies a zone in the centre of the pitch from where he can support his teammates should the opposition play through the press. Again, from the same game, Bournemouth have possession just inside the Spurs half on the right side of the pitch and Spurs have numerical superiority in pressing the ball with three players at different depths and angles. Once again you can see that there is one Spurs midfielder who does not join the initial press but is available if needed. On this occasion it is Liverpool that are building an attacking movement and as they cross the halfway line then Spurs begin to apply pressure to the ball carrier. The three circled players will close on the ball, ensuring that the man in possession will either have to play a difficult pass through the press or turn the ball back towards his own goal. Once again there will be a free player supporting the initial press and this time we see the Spurs defensive line aligned perfectly in this position. In recent weeks there have been sections of the Spurs support that have been calling Eriksen the weakest of Spurs’ outfield players. I feel that this may be somewhat tongue-in-cheek though, as while the Dane does not comply fully with the coaches’ defensive instructions he is key to Spurs’attacking play. One of the things that Eriksen does better than almost any one else in English football today is find and occupy space. This may appear relatively simple in tactical terms but the impact on the opposition that Eriksen has is difficult to quantify. This is an example from the North London derby against Arsenal as Spurs attack from the right side. All that Eriksen has done is move into space behind the Arsenal midfield and in front of the defence – but straight away he is forcing four Arsenal players to account for his presence. Something as small as this can distort the oppositions’ balance and create space for other teammates. Eriksen is a player in a similar mould to the likes of Mesut Özil or Thomas Müller in that positionally they are so good that they appear to be lazy or disinterested at times. They have an innate understanding of space on the pitch and they are able to effectively occupy that space with a minimal amount of effort. Whilst it is true that Mauricio Pochettino is part of Marcelo Bielsa’s coaching tree, it is extremely interesting to see the Spurs coach evolving and developing his own concepts and coaching structure as he becomes more experienced. This Spurs team has one of the lowest average ages in the league and if the players can continue to learn and to develop under Pochettino, then there is little doubt that they will soon be challenging for a top four finish at the very least.